Ask any Singaporean what Singapore is most famous for and you will probably get “food” as an answer. As Singaporeans, we all take pride in our affordable local hawker fare. Some of us might even proudly proclaim we prefer dining in hawker centres, compared to fine dining in a restaurant. If you are someone who enjoys cooking as much as you enjoy your local food and wish to share your love for cooking with the public, SBL Singapore can help you do so. Whether it is setting up your own hawker business or expanding your current business, SBL Singapore will be able to provide you with the necessary funds and timely business advice to do so. Throughout the course of our business, we have helped many Singaporean hawker stall business owners take that first step in opening their very own hawker / food stall. One of the hawker stalls we have helped is ‘Yuan Ji Prawn Noodles’ helmed by the Teo brothers. Both brothers discovered their love for cooking after watching their stay at home mother tirelessly prepare meals for the family. Every day after school, they would look forward to lunch prepared by their mother. After trying all her dishes, they both came to a consensus that her prawn noodles was still the best. They then sought the expertise of their mother who taught them how to prepare the dishes. Years later, after their mother had passed on, they felt that they needed to continue her legacy. This was when they decided to set up their very own prawn noodle stall. Financially wise, they were able to cover the cost of the initial metalwork and equipment cost. However, they required a 2 month rental deposit which proved to be quite a strain on their finances. It was then that they decided to seek the help of SBL to help them cover their initial rental deposit. Today, their prawn noodle stall has gained a slew of loyal customers and they are looking to set up another stall in the North of Singapore. Launched in February 2018, SBL Singapore aims to provide financial assistance to all companies including those in the hawker / food stall industries. We also gather mentors in the food and beverage fields through our Coach-and-Go programme for our clients to attain more information and knowledge on business management. Our objective is to help local Singapore brands grow and enter the overseas market. 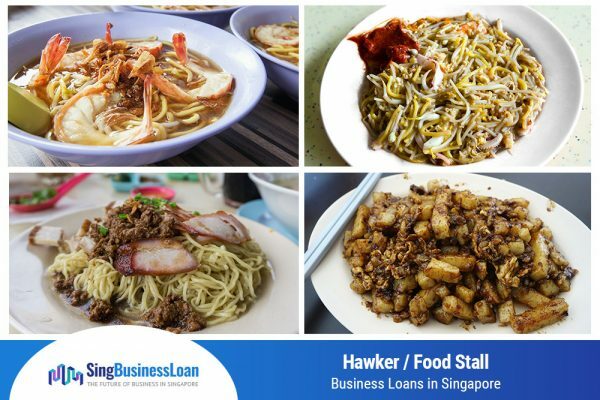 With a Hawker / Food stall Business Loan, you pay for an inexpensive and reasonable rate of interest on monthly repayments, ensuring that you have enough capital to remain competitive and grow your business. In addition to funding, you will also obtain the mentor-ship and operation assistance that you require.